It is indeed true that Alexandria Ocasio-Cortez (AOC) is the anti-Trump. Instead of being a wealthy businessman with decades of success, she is street trash that was sweeping the gunk off restaurant floors just a year ago. Where Trump won a tightly contested election through bold policy and uncompromising attitude, AOC won a primary solely for being a brown-skinned in a redistricted zone of Latinos. And while Trump began his memorable reign delivering on his promise to curb migration from terror hotbeds, the first step in the Ocasio-Cortez political career was a prompt vote in favor of funding the I.C.E. agency she swore to destroy. “Her views don’t represent a lot of my constituents,” Sen. Jeanne Shaheen (D-NH) said of Ocasio-Cortez to The Hill. Sen. Doug Jones (D-AL) agrees with Shaheen, who told The Hill that Ocasio-Cortez becoming the face of the Democratic Party hurts its brand. “I think it skews what’s really there for the Democratic Party,” Jones, the Senate’s most vulnerable member, said. He warned that if House Democrats attempt a far-left agenda, its legislative accomplishments will be few and far between. “If the House did all the crazy things on the left that the House did on the right for the last two years, that’s not going to happen,” the Alabama Democrat said. “With all respect, I certainly hope she’s not the future and I don’t believe she is,” Lieberman, who retired in 2013 after serving nearly 25 years in the Senate, told the Fox Business Network last Thursday. This is gonna be a wild rodeo, and doggone it I think us red bloods should buckle up and enjoy the ride! In truth, Ocasio-Cortez really is the dentally-deprived face of the Democrat party’s future, and her methods thus far are the exact blueprint of what to expect from the blue team in the coming years. But be not distracted by the flagrant socialist tendencies, which have long gained full control of liberal college campuses and the majority of basic TV networks. For the real story of AOC, look to her nature to wage total race war against Democrats everywhere. As aforementioned, Ocasio-Cortez won the rezoned 14th congressional district of New York strictly by going door to door to her constituents and saying “Hey, we’re 55% Latino and only 18% white, why are we letting Them rule over us?” And so it went, that in just a few months’ time, one of the longest reigning Democrat congressman’s political career was killed in a primary by his party’s own poison: multiculturalism. And now, many decades after Lyndon Johnson’s introduction of plantation politics to the white elites of the Democrat party, the donor class of blue states finally have found themselves with no control of the fires they’ve been lighting. The newly-elected politician added: “Unacceptable in 2019. Try again.” The Twitter post has currently racked up close to 4,000 shares, with nearly 20,000 users “liking” the stance. The tweet caught the attention of Josh Kraushaar, politics editor at the National Journal, who hit back on the social media platform likening Ocasio-Cortez to president Donald Trump. “Another thing AOC has in common with Trump: media scold,” Kraushaar wrote on Saturday, using the common abbreviation for Alexandria Ocasio-Cortez’s name. It didn’t end there. Not backing down, the politician countered: “Or: maybe having powerful editorial positions awash in people from one race, class, or gender isn’t a good idea; since we get 1000% more takes on ‘brown lady says a curse word’ than an actual white supremacist in Congress. If you won’t look the mirror, people will do it for you.” As noted by The Hill, Ocasio-Cortez was speaking in reference to a post by Media Matters for America which she had re-tweeted earlier. 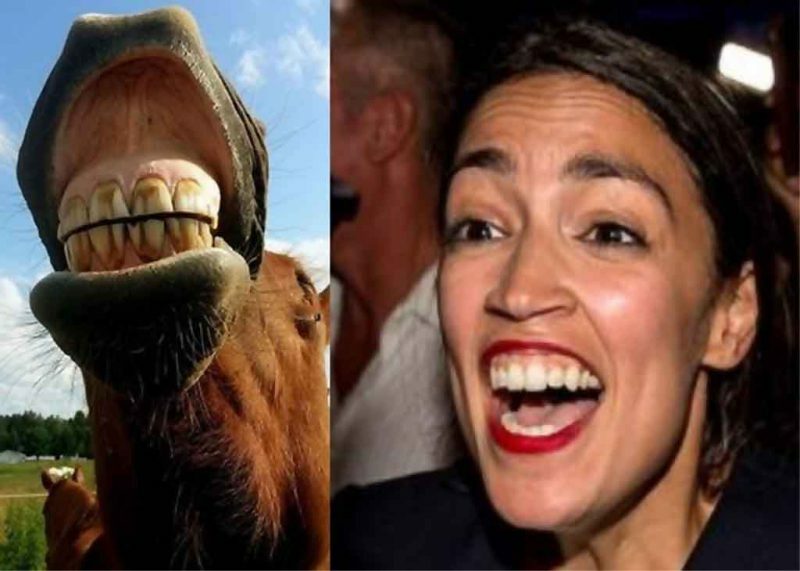 With the Constitution Article II Clause One Section Five keeping the prospect of presidential run still many years away, right wingers can sit back and enjoy as Horsefaced-Cinderella breaks loose from the stable and wrecks the Democrat cotton fields. By knocking off many of the DNC donor-class politicians through primarying guano crazy animals like Georgia’s Stacy Abrams, AOC will be setting up Republicans for some nice pickups in longshot areas. Yee haw! At least, unless they are minority-majority areas, in which case the browns, yellows, reds, and tans will simply vote D because that is what they always do. So if you weren’t yet convinced that a multicultural society is nothing more than a racial head count, take a look at the physical and political train wreck that is in fact Alexandria Ocasio-Cortez. Genes really do matter, and monarchy has never looked more appetizing than after the ensuing circus of a dirty millennial dishwasher taking a seat in our subverted House of Representatives. But fellas, don’t worry about trying to tie this one back to the stable. It’s best to just let her thrash on through Twitter and congress, mule-kicking, and defecating over everything in sight. ¡Arriba, Arriba! ¡Ándale, Ándale!